The old shrine of Kuan Ou. On the river near the Princess Mother Memorial Park is the old Chinese shrine of Kuan Ou. 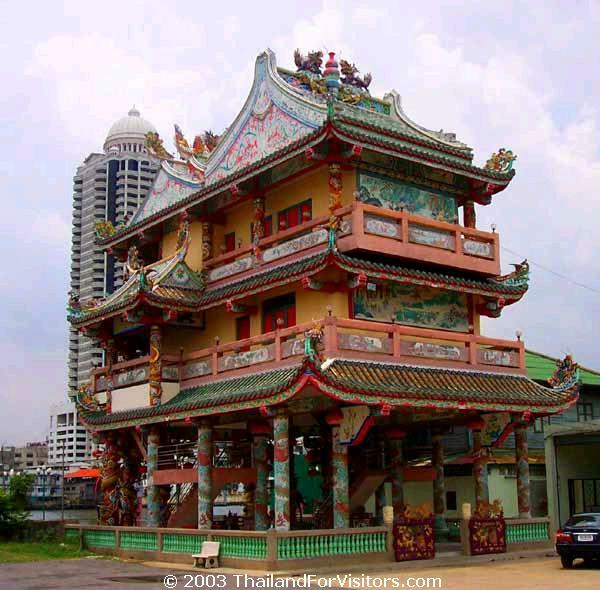 Like most Chinese shrines around Bangkok, its not in any guidebooks and there isn't much background information available. The modern river-side tower sheltering a goddess of the water. 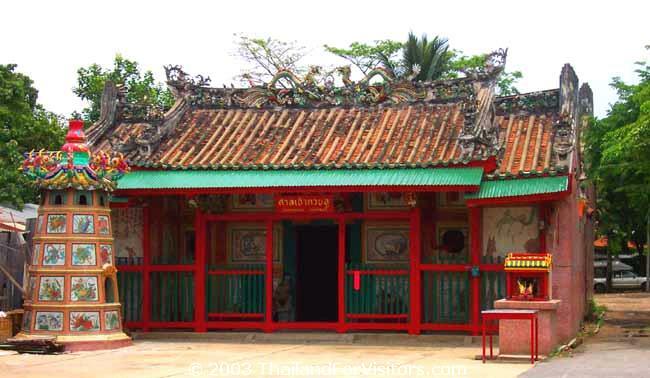 The shrine, or "godfather's hall" as they are called in Thai, almost certainly dates from before Bangkok's founding. This area was formerly the main port of Siam back in the time when Ayutthaya was the capital. The district was home to traders from many lands, including China and Portugual. Right on the riverbank in front of the shrine is a modern short tower that you can easily see from the river. In the center of the tower is an statue of a goddess with a small alter in front. She is flanked by two near life-size statues of horses. The columns supporting the two upper floors are wrapped with dragons in typical Chinese style. The easiest way to get to the shrine is by boat. Take the Chaophraya Express Boat to the Memorial Bridge Pier, cross the bridge, and follow the route to the Princess Mother Memorial Park. See our map for exact route.